The Interfuse ELM327 v1.5 scanner adapter is a car diagnostic tool that can be connected to iOS over Wi-Fi and to Windows laptops or desktops via the USB cable. The USB cable plugs directly into the scan tool which can be used with or with it depending on the platform you are using. The scanner will transmit data to your device in realtime allowing you to monitor your vehicles health as well as allow you to check and clear the vehicles Check Engin light. 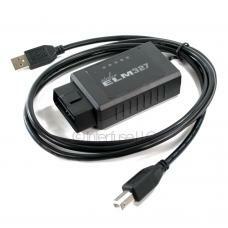 Compatible with OBD-II compliant vehicles, iOS and Windows computers. Works great with DashCommand, ScanXL, EasyOBD-II, ScanMaster ELM and more. Includes hardware as well as Wi-Fi and USB setup instructions. Receive realtime data from your vehicle and diagnose the check engine light.